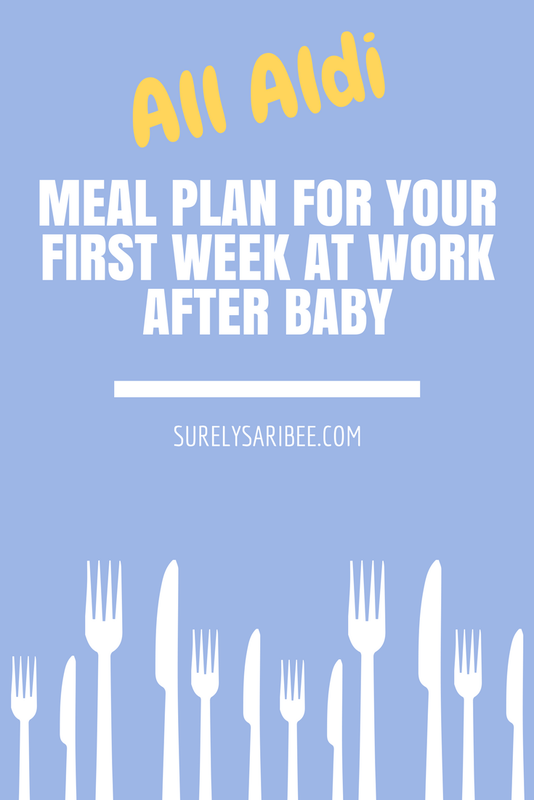 Going back to work after baby is a huge adjustment when you just went through an adjustment just a few weeks ago! You have a few precious hours to soak up your baby in the evening, during the witching hours nonetheless. What’s key to your survival is meals that are filling, simple, don’t require a lot of prep time and can give you leftovers so you don’t have to worry about lunches. You’ve got enough to think about so I’ve done the work for you. Each meal should make enough for two people to have for dinner one night and leftovers for lunch the next day. Sunday: Chili. I have my favorite technique but I never measure spices or make it the same way twice. I just dump. This recipe is similar but you can easily adapt chili to add any veggies you like. I rotate between using ground turkey and ground beef. Serve it over pasta or rice with cheese and other toppings. No matter how hard we try to finish a whole pot on our own, we always have to throw a serving or two away. We can't eat it fast enough. So if this is your first baby and you only have two mouths to feed, freeze a third of it! Pack leftovers for your lunches Monday. Monday: Campbell's chicken rice casserole and veggies from a microwave steamer bag. The prep time on this is fast even though it has to be in the oven for a while. 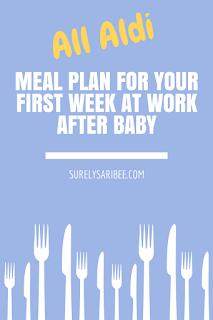 Hand the super-simple recipe to your spouse and have them prepare it while you snuggle your baby after your first day of work! Wednesday: Salsa chicken. This is so quick to prep in the morning as a crock pot meal or in the evening in the instant pot and has so many ways you can serve it for leftovers. Make a double batch so it can serve as lunches for the rest of the week. Thursday: Crock pot or instant pot roast. My secret ingredient to make it even more flavorful is Aldi steak seasoning. Friday: Dutch pancake, eggs and whatever breakfast meat is your favorite. Plus some fruit. On Fridays, I like to do a meal that takes a tad bit more prep time since I have the whole weekend to spend with my family instead of just that evening. Plus, I don't need to make sure we have lunches to pack for Saturday so it doesn't need to make easy leftovers. Dutch pancakes don't require you to stand over the skillet the whole time! I love to top them with berries. This is my favorite recipe for them and they are wonderful if you add blueberries before baking!